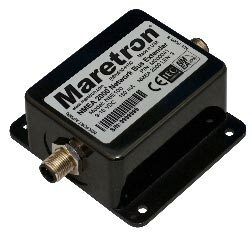 Maretron's NBE100 (Network Bus Extender) allows you to extend the maximum node count, network trunk length and cumulative drop length of any NMEA 2000® network. The NBE100 solves bus errors and other electrical issues caused by exceeding any of these limitations and makes design of large networks easier. NMEA 2000® networks have a maximum of 50 nodes allowed on a single network, a maximum network trunk length of 200m and a maximum cumulative drop length of 78m. If you have a network that exceeds any of these specifications, you can simply disconnect the network trunk in the middle and connect the ends to the NBE100, along with additional termination resistors. This will split the network into two electrical segments, each of which can have up to 50 nodes, for a total of 100 nodes on the logical network. The NBE100 will transparently route NMEA 2000® messages between the two network segments, making them work as a single logical NMEA 2000® network. 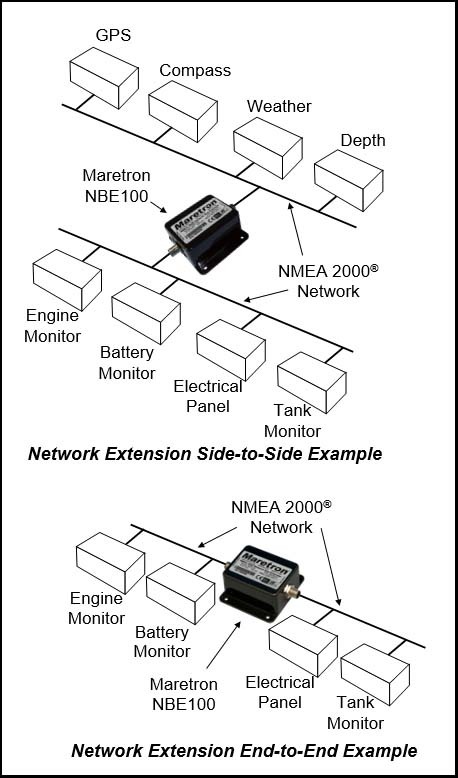 Segments a single large NMEA 2000® network into two smaller electrical segments. Allows you to exceed the 50 node limitation on a NMEA 2000® network. Allows you to exceed the 200m trunk length limitation on a NMEA 2000® network. Allows you to exceed the 78m cumulative drop length limitation on a NMEA 2000® networks. Allows all NMEA 2000® devices to operate as if they were still on a single NMEA 2000® network. Extending NMEA 2000® networks beyond the 50 node limitation. Bridging Maretron NMEA 2000® network to pseudo NMEA 2000® networks. Building in system redundancy for ultra reliability application.